China, which currently serves as the locomotive of world trade and the world's second largest economy, is continuing to strengthen economic and investment ties with the United Arab Emirates (UAE), specifically in Dubai. The Dubai Economic Council (DEC) is seeking to heavily deepen the partnership between Dubai and China by proposing mechanisms and policies and communicating with the various economic departments in China. China, being a world-leading economy and the UAE, an emerging market within the global economy are both looking to continue boosting their respective economies by creating stronger investment partnerships. Over the years, Dubai has managed to prove itself as a regional, global trade hub providing state of the art logistics, in addition to its modern infrastructure and extensive network. This extensive network includes shipping lines and transport with the highest international standards, making it an appealing market for investors from all over the world. In addition, Dubai also has strong bilateral business relationships with a number of different countries, from the east and the west, but the relationship with China is of special strategic significance beyond the tradition to affect vital areas such as energy, industry and infrastructure, including a number of strategic projects in the pipeline by major Chinese companies. The Government of China is supporting the creation and development of several projects in the Emirates. These include: tourism, industry and retail in addition to recycling. With these two major Asian economies on the rise and building meaningful investment ties, it will be interesting to see how private investors react to the major business and investment opportunities that will emerge in both the Chinese and UAE markets. The UAE will continue to welcome Chinese investment in all areas, focusing on tourism, especially in light of Dubai vision 2020 to develop the tourism sector. 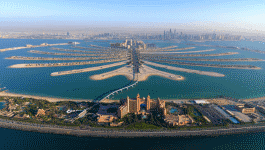 The goal is 20 million tourists & AED 300 billion in tourism revenues annually, by 2020.